During your unforgettable Romance Tour to Veliky Novgorod you have a great opportunity to enjoy this Russian ancient city and meet beautiful and loving Russian women. The women residing in V. Novgorod have had very little chance to meet western men and are eager for the occasion to do so. Located on the Volkhov River near the point where it leaves Lake Ilmen Veliky Novgorod is one of the friendliest and oldest cities of Russia. Veliky Novgorod (not to be confused with the city of Nizhny Novgorod on the Volga River) is situated on the North-West of Russia, 180 kilometers from Saint-Petersburg and 524 kilometers from Moscow. V. Novgorod was first mentioned as a fortress in the chronicles of 859, and this date is accepted as a starting point of the city's age. Starting from the very early stage of its existence, V. Novgorod had a quite different political order than other Russian cities. From the 12th century, the V. Novgorod Land became an independent feudal republic managed by veche - a gathering of representatives of all city parts. 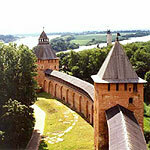 At Veliky Novgorod height, in the 14th century, its population rose to c.400, 000. Its splendor during that period, its hundreds of churches, its great shops and arsenals, its huge fairs, have all furnished rich themes for later Russian art and folklore. Although it became a vassal of Moscow after the Muscovite invasions in 1456 and 1470, V. Novgorod was allowed to retain its self-government. It was not until 1478 that it came under Moscow's complete control and lost its freedom. V. Novgorod retained its commercial position until St. Petersburg was built in 1703. Nowadays, V. Novgorod is a city with nearly 230 thousand residents. Numerous restaurants, cafes and bars open their doors to the guests. There are also night clubs, theatres and casinos in Veliky Novgorod. Veliky Novgorod is an excellent choice for your Romance Tour destination because V. Novgorod women have been known as beautiful and family-oriented. They are really charming, feminine and stylish.